Eddy Fondo a former KBC presenter dies in Kilifi Hospital at 65 years after a short illness. - Bana Kenya News, Real African Network Tubanane. Home featured Mombasa Eddy Fondo a former KBC presenter dies in Kilifi Hospital at 65 years after a short illness. 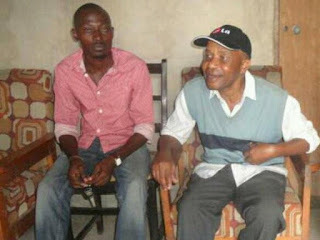 Eddy Fondo a former KBC presenter dies in Kilifi Hospital at 65 years after a short illness. KBC radio Veteran Edward Fondo dies in Kilifi General Hospital today following a short illness. The Radio veteran died in Kilifi after he was diagnosed with stomach pilferage problems. Eddy Fondo from Kaloleni was picked and groomed by another Veteran Lenard Mambo Mbotela. The presenter Eddy Fondo died aged 65 upon arrival at Kilifi county hospital on Tuesday. He had been referred there from Mariakani sub-district hospital following the worse conditions. "Eddy complained of stomach problems which doctors found to be as a result of a perforated gut.He was admitted to Mariakani hospital but his condition worsened." said family member Nelson Gona. "Fondo was a very reserved person who kept to himself most of the time. He was loved by many musicians and promoted local bands," Gona said. "He is the person who made "Simba wa Nyika" very popular and used to play the song, Pamela. He used to call himself (Music DJ) Fondo. He was an expert in radio continuity and I used to host him with Khadija Ali." He added. He has left one wife, a daughter, a son and three granddaughters in his home at Kaloleni. His body was taken to Kilifi hospital mortuary. Fondo was very famous in reading a popular radio Program known as "Salamu za adhuhuri" and another programme that was aired earlier was Chaguo Lako programme on Voice of Kenya in the 1980s and 90s.